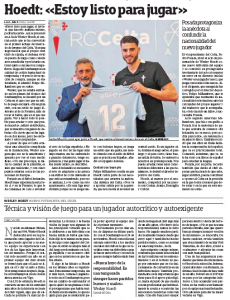 On Tuesday, as Wesley Hoedt completed his transfer to Celta Vigo, initially on loan, Spanish newspaper AS put a bit of a dampener on it for fans of the Galician club. It was was explained that the defender hasn’t played since November, meaning he won’t have any match rhythm, and that Southampton have conceded far fewer goals without him in the team. They did, however, point out he was very tall. It wasn’t the greatest endorsement. La Voz de Galicia see things very differently, and are talking up Hoedt to not only be a great footballer, but also a fantastic human being. His ‘technique and vision’ are the big selling points, with it being explained Hoedt reads the game really well, which should help Celta. La Voz explain the Dutchman is really good at playing the ball out from the back. After signing, Hoedt told Celta’s local media that his game will be better suited to Spanish football. But that’s not to say he’s over confident, oh no.